A macular hole is a hole in the center part of the retina that is located at the back of the eye. The macula contains light-sensitive cells which provide clear, sharp central vision. Specifically, the hole or defect occurs in the fovea, the center of the macula and the most delicate part of the entire retina. Macular holes typically occur in people over the age of 60. At first a macular hole may only cause a small blurry or distorted area in the center of the vision. 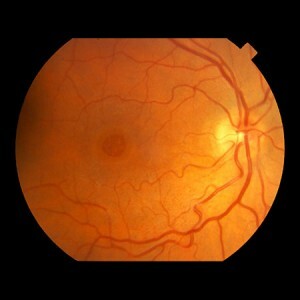 As the hole grows over several weeks or months, central vision progressively worsens. Peripheral vision is not affected. While some macular holes resolve on their own, in most cases surgery is required to effectively restore vision. The success rate of the surgery varies based on the severity and chronicity of the condition. An outpatient procedure, known as a vitrectomy, is performed to remove the vitreous gel, and a gas bubble is injected into the eye to help close the hole. As the eye heals, the gas is naturally replaced with fluid.